I LOVE hot chocolate, the sweet delicious beverage is just the best thing. 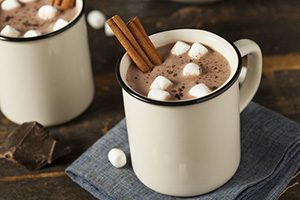 And I’ve always thought the best time to have hot chocolate was before bed (or out in the snow) so wanted to know what it does. Does hot chocolate help sleep? I decided to find out so spent many hours researching to bring you this post. Enjoy! I’ve already looked at Horlicks and milk and how they affect sleep and think hot chocolate might be similar in that it can help you sleep but it won’t definitely help you sleep. Part of the reason it can help is that it is super relaxing, you get a nice endorphin hit from the chocolate while the warm drink is utterly soothing. And it becomes twice as effective if you had it growing up, if you grew up having a hot chocolate and then going to bed you likely built up an association that tells you when you have hot chocolate it’s time to sleep. And if you had the association as a child it will still exist as an adult so you can tap into it by having a hot chocolate and you’ll start to feel sleepy. In the hot chocolate itself (I looked at the classic which is Cadburys) there isn’t much in the way of vitamins and minerals that could help you sleep. The milk you make it with certainly has more, you get some nice magnesium and a few other things but even that is lacking in quantities that will make a real difference. So the fact that it helps sleep comes from the relaxing and psychological factors only. Now it’s no secret that hot chocolate is sugary and I don’t think I need to tell you that you should be brushing your teeth after you drink it. And the thing about sugar is it gives you a spike in energy, it’s not as bad as caffeine as a stimulant but it still isn’t great. So the jury is out on the sugar, I definitely wouldn’t have a hot chocolate every night before bed but once in a while is fine I’m sure. All about moderation.